Will a redesign give the Kia K900 the sales boost it sorely needs? The Kia Stinger is attracting attention as a serious rival to the likes of its more established BMW and Audi competitors, yet the K900 fell under a lot of people’s radars and has been a slow seller in the US - despite being a in the premium market. It’s only been on sale here in the US since 2015 but has been available in other markets since 2013 sold under different names. Luckily, the flagship Korean sedan is about to get revitalized, as the new second-generation Kia K900 is just around the corner. It will also pack new technologies that “protect occupants, enhance interior comfort and give the driver greater confidence at the wheel.” While the current K900 is only offered with rear-wheel drive, the new-generation model is expected to be sold with all-wheel drive and new engine options. 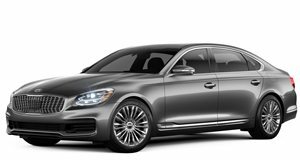 The current K900 is available with a 3.8-liter V6 pumping out 311 horsepower, or a more potent 5.0-liter V8 that delivers 420 horsepower. Hopefully it will adopt the Stinger’s twin-turbo 3.3-liter V6, too. Kia hasn’t hinted when we can expect the 2019 K900 to break cover, but we'll likely see it debut at the New York Auto Show in late March since Kia says the new flagship sedan will go on sale Q2 2018.